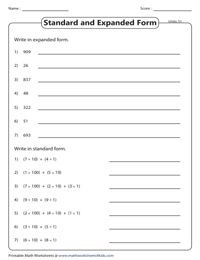 Employ this set of worksheets based on expanded product form and standard form to assist students of grade 2, grade 3, and grade 4 in gaining a better understanding of place values. 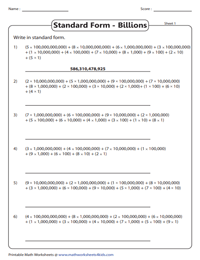 Exercises include transforming numbers in standard form to expanded product form and vice versa. 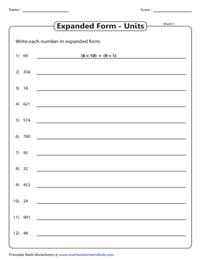 To enable quick and easy downloads, worksheets are segregated according to the place value. 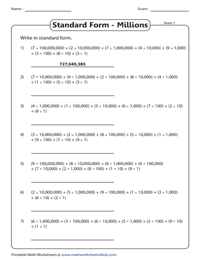 These worksheets comprise 2-digit and 3-digit numbers. Rewrite them in expanded product form. 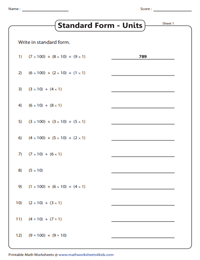 Observe each number provided in product form in this group of worksheets. Change them into standard numeric notations. Place values are presented in multiples of 10 and multiplicands range within 1 to 9. First convert the numbers given in standard form into product form and then move on to the next set that requires learners to do just the opposite! Transform each 4-digit, 5-digit or 6-digit number from the standard form to expanded product form. Presented here are the numbers provided in the expanded product form. Convert into standard numerical form. 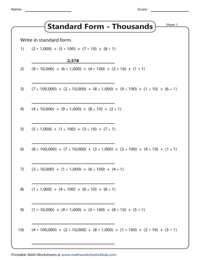 An example is attached with each worksheet for reference. 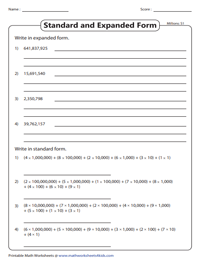 This series of worksheets requires students to rewrite numbers from standard form to expanded product form and vice versa. Use the answer keys to validate your responses. 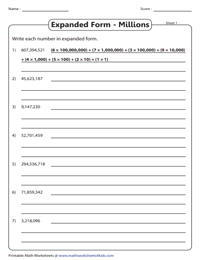 Transform each 7-digit, 8-digit or 9-digit numbers contained within this set of worksheets in expanded product form. Keenly perceives each number represented in the expanded product form and convert them into standard form. Be mindful of where zeros need to be inserted, when place values are absent. 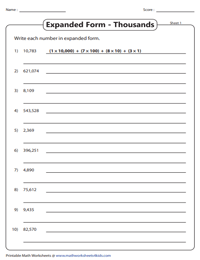 Test a student's comprehension on place values by getting them to transform numbers in standard numeric notation into expanded product form and vice versa! Featured here are 10-digit, 11-digit and 12-digit numbers. Rewrite each number in product form by splitting up all the digits and multiplying them with their pertinent place values. Multiply each digit with the respective place values given in expanded notation. Then, sum them all up to write them in standard form. Take care to group the numbers correctly to match the place values given. 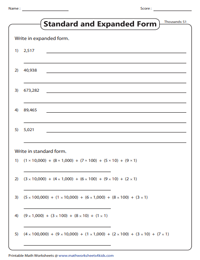 Use this assortment of worksheets to convert numbers up to 12 digits into product form. Also, rewrite numbers given in product form into standard numeric notation.